The Charlotte Stone Crabs watched their four run lead disappear as they took a 7-6 extra inning loss at the hands for the Fort Myers Miracle on Friday night at Hammond Stadium. A costly error in the bottom of the eleventh inning led to the Stone Crabs dropping their second straight game to Fort Myers. The Stone Crabs took the lead in the first inning. Shawn O'Malley led off the inning with a walk. O'Malley then stole second and moved to third on a throwing error by Fort Myer's catcher. Tim Beckham plated the run with a sac fly to score O'Malley and give the Stone Crabs a 1-0 lead. The Stone Crabs would add another run in the third. O'Malley once again found a way to get on base, this time being hit by a pitch. Gabe Kapler, who is with the Stone Crabs on an MLB rehab assignment, followed by drawing a walk, moving O'Malley to scoring position. Beckham picked up his second RBI of the night with a line drive single to left that score O'Malley and gave them a 2-0 lead. Charlotte furthered the lead in the fourth inning. Isaias Velasquez, Michael Sheridan and Anthony Scelfo all drew walks to load the bases. O'Malley followed with a double to center, scoring two runs and increasing the Stone Crabs lead to 4-0. But that four run lead was erased in the bottom of the fourth when Fort Myers produced five runs in the frame. Dan Rohlfing drove home two runs with a double and Estarlin De Los Santos, Brian Dozier and Nate Hanson all picked up RBI's that gave the Miracle a 5-4 lead. The Miracle increased their lead in the sixth inning. Dozier singled to right, scoring Jonathan Goncalves to take a two run lead. 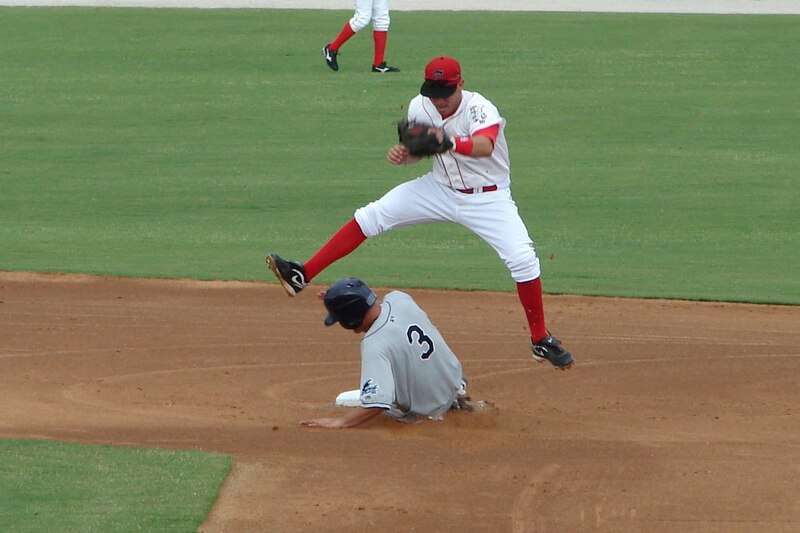 The Stone Crabs added a run to their total in the seventh inning. Stephen Vogt singled to left to lead off the inning. Vogt would later score on an RBI single by Sheridan to pull the Stone Crabs to within a run of the lead 6-5. Charlotte fought back to tie the game in the eighth inning. O'Malley reached base again via a walk to lead off the inning. He advanced to third on a single by Greg Sexton. Beckham plated the tying run with a single that scored O'Malley to tie the game 6-6 and force extra innings. The game would remain tied until the bottom of the eleventh inning. De Los Santos led off the inning with a single to left then advanced into scoring position on a sac bunt by Dozier. De Los Santos would score on a single to second by Evan Bigley that was thrown into the stands by Scelfo, allowing the winning run to cross the plate. Frank De Los Santos struggled with the start, allowing 5 runs on 9 hits in 3 2/3 innings. Michael Jarman took over the hill and pitched 2 1/3 innings, allowing 1 run on 2 hits with a strikeout. Marquis Fleming pitched 2 shut-out innings, allowing 2 hits while striking out 2. Zach Quate lowered his ERA to an amazing 0.49 with 2 more scoreless innings, allowing a hit while striking out 2 and walking 1. Neil Schenk suffered the hard luck loss, pitching 2/3 of an inning and allowing an unearned run on 2 hits with a strikeout and a walk. The Stone Crabs look to avoid the sweep as they wrap up the series against Fort Myers on Saturday night at Hammond Stadium. Shane Dyer (4-2, 1.25) will be making the start for the Stone Crabs against Liam Hendriks of Fort Myers (4-2, 1.42).